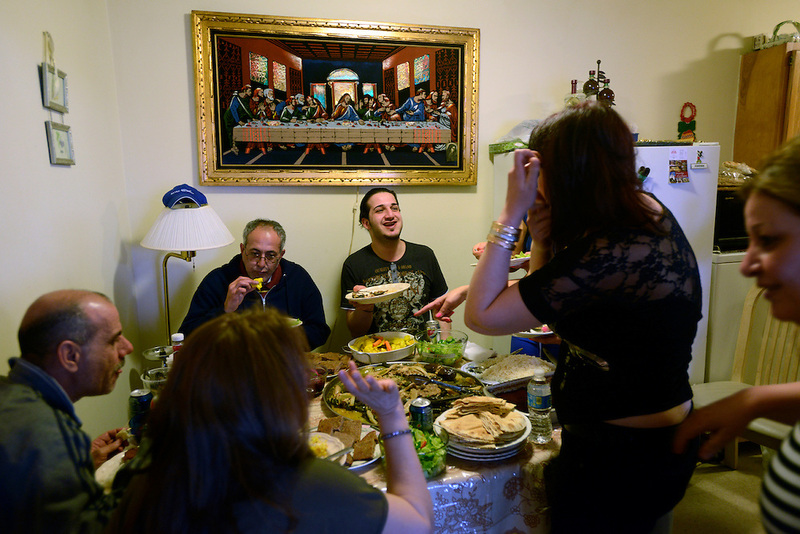 The Shamoon family celebrates over a meal of traditional Iraqi food the arrival in the United States of family members from Baghdad. The Shamoons are Chaldean Catholics and as part of the Christian minority in Iraq, they have been persecuted by radical Islamist militias and have been forced to seek asylum in the US. Madison Heights, MI, USA. 17/04/2013. 2013 J.B. Russell USA America Iraq Iraqi refugee asylum resettlement immigration christian Chaldeans last supper food dinner family arrival celebration Middle East Madison Heights Michigan.